It’s been a year since New Horizons’ flyby of Pluto occurred. Scientists expected the data to take several months to be collected, and it took even longer than they predicted, but as of last week, all the data is officially in. The second delivery of data to the Planetary Data System will come this month. They (and we) eagerly anticipate the new pictures from both high quality cameras and color cameras. Two more releases have been scheduled for the Pluto flyby data, one in April and another in September of 2017. 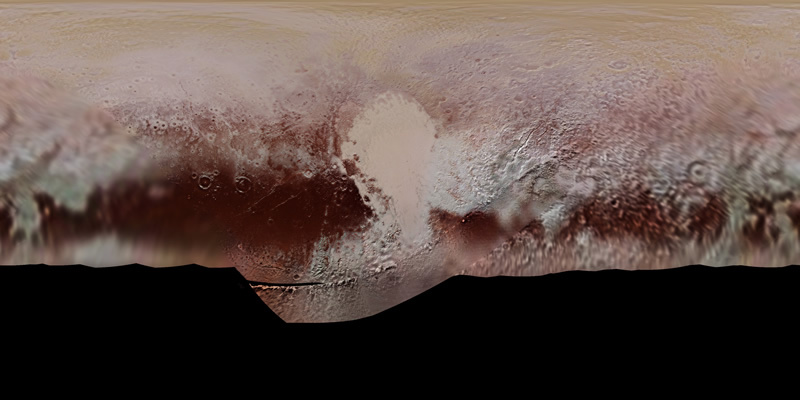 Moreover, NASA shared this vivid color map depicting the way Pluto’s surface color changes with its latitude. Now let’s take a reminiscent look at what we’ve learned from the New Horizons mission over the past year. In 2015, the team struggled with whether or not Pluto and Charon had the same compositions despite having different densities. Charon may be less compressed since it is considerably smaller. Recent studies have shown that their compositions are indeed different. Charon is about 59% rock, while Pluto is 65-67% rock. There was a lot of discussion about Sputnik planitia, the “left ventricle” (which should actually be the right ventricle from Pluto’s perspective), the once mysterious bright spot on Pluto’s surface. But Pluto’s climate modelers were thrown for a loop when they discovered a giant nitrogen-rich basin on the ex-planet, because of its natural intake and release of gas. Sputnik planitia was once called Sputnik planum, but has since been changed due to the discovery that it is a basin of ice sheet 2.5 kilometers below Pluto’s mean elevation. Therefore, it is a basin and not a plain (an impact basin, in fact), which scientists calculate was made by a 200 kilometer body. Scientist Oliver White noted that the color of the basin changes between the northern and southern regions, and that the northern boundary between the brighter and darker surface coincides with its northern arctic circle. He also noted that there seems to be more evidence that suggests the existence of sublimation pits in the northern region, which may be due to a net sublimation of nitrogen and net deposition in the south. More eagerly awaited data will be available to the Planetary Data System soon, and more speculations and conclusions are being made about the already available data every day.